Every pepper needs to have some kind of self-defense weapon laying around to keep unwanted guests out of your home. 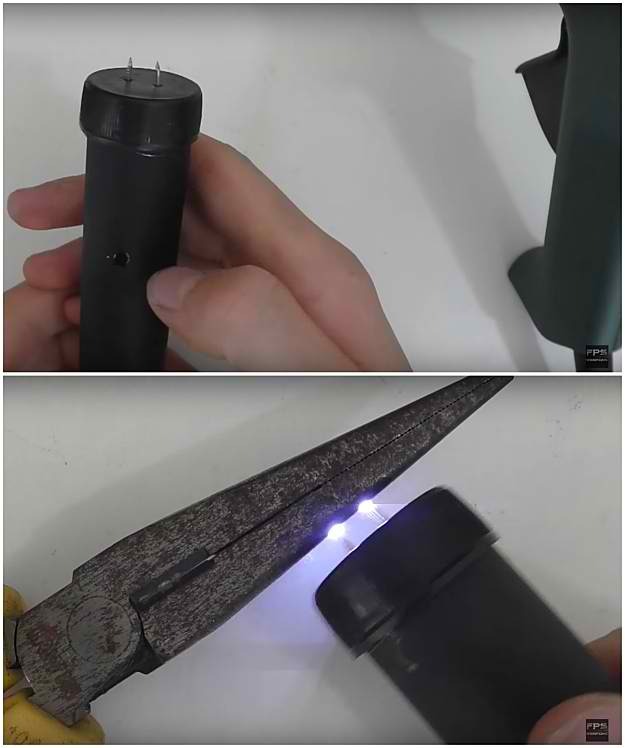 But if you’re not comfortable with using a knife or just want to use something a little more special you could opt to go for a homemade stun gun. A stun gun is an electric weapon that is used to immobilize an assailant within arms reach. The stun gun gives a shock to the attacker which temporarily disables him from doing anything because of the pain from the shock. Leaving you free to deal with the unwanted guest. 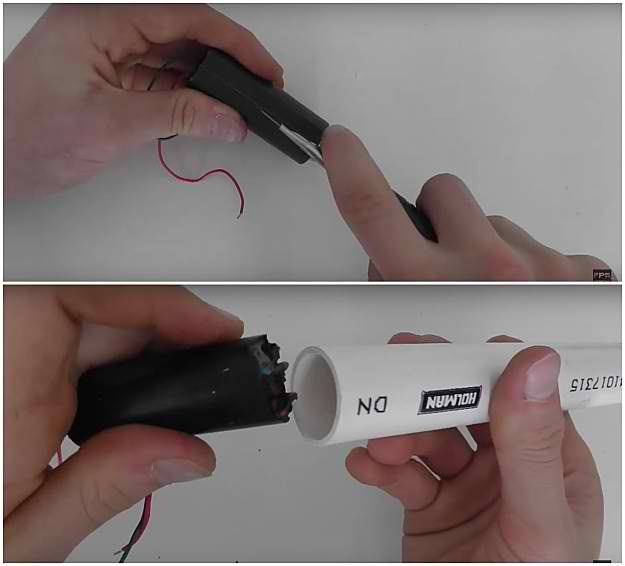 Should you not know how to make a stun gun yourself than you’re in luck. 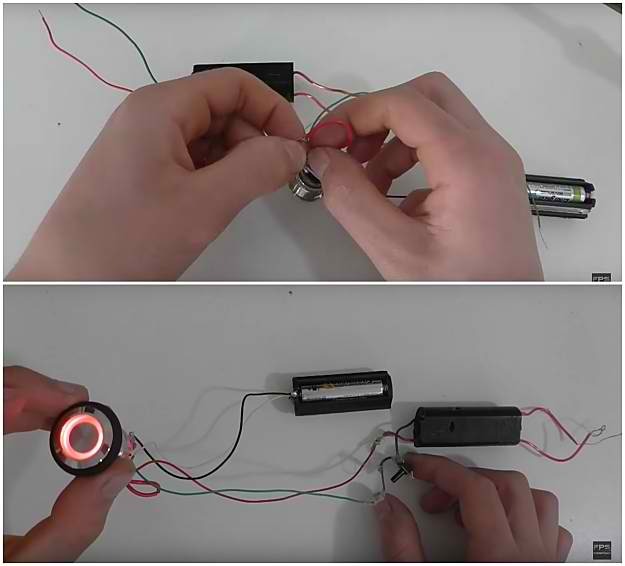 Below you’ll find an easy to follow tutorial so you can start making your own stun gun. 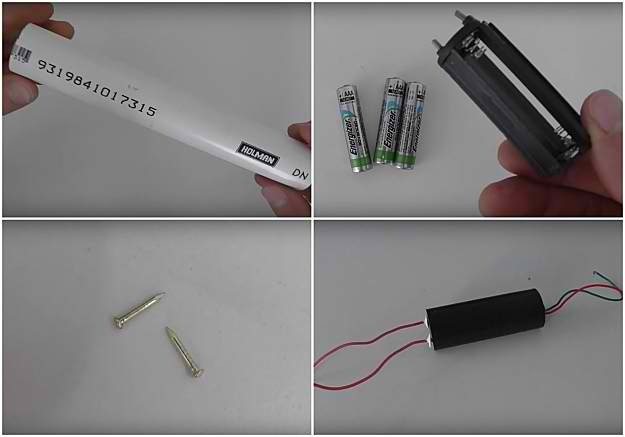 As a homesteader who creates, builds, repurposes, and recycles, you may already have the materials to make a homemade stun gun at home or in your tool shed. For the inverter, a high voltage one, specifically one which can produce up to 400, 000 volts is recommended. Take out the outer layer of the inverter for the circuitry part to fit in. Using a cutter and pliers, carefully peel off the outer layer of the inverter. Once the outer layer is gone, the inverter will easily fit in the PVC pipe. This elementary electronic schematic shows how you will assemble the circuits to make the Taser work. The battery is connected to the on and off safety switch which is the red LED button. It is then connected to the momentary switch that we press to make the Taser spark. 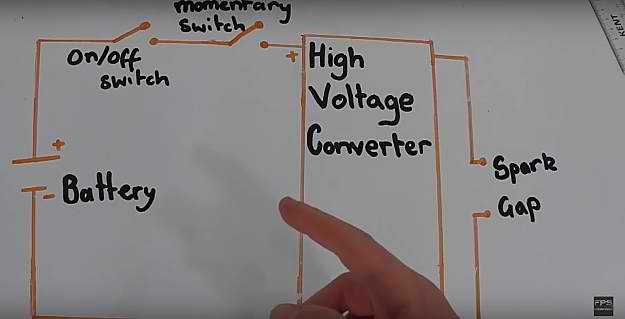 This leads to the high voltage converter connected to the spark gap where the spark zaps through or between the two prongs which lead back to the battery. Now we go to our PVC pipe. Spray paint the pipe with a black matte spray paint and leave it to dry. Cut the pipe in two so you can have access to the batteries when replacing them after they’ve run out. Measure 13 cm from one end of the PVC pipe and cut from there so you have another 7 cm PVC pipe. Drill a hole for the main switch some 4 cm from the top of the longer PVC pipe where the momentary switch will be inserted. 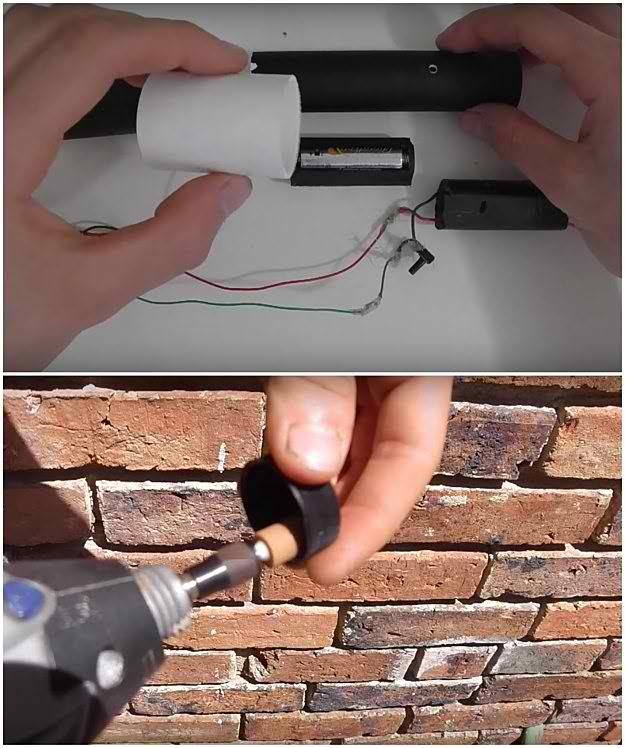 Use a PVC coupling to join the two separate PVC pipe pieces securely and for replacing the batteries. Now to assemble the Taser stun gun, insert the safety switch with the red LED button to the shorter cut PVC pipe piece. Use glue to fasten the safety switch securely to the bottom of the shorter PVC pipe. Insert the rest of the circuitry including the momentary switch. You will need to seal the top of the stun gun and assemble the prongs. You can use a plastic soda cap but you will have to remove the extra plastic lining inside with a grinder so it fits the pipe perfectly. Puncture two holes on top of the plastic cap from which the two small brass nails will be inserted. Connect wirings to the brass nails which will serve as the prongs from which electricity can zap. Secure everything with hot glue and place the cap over the PVC pipe also securing it with glue. 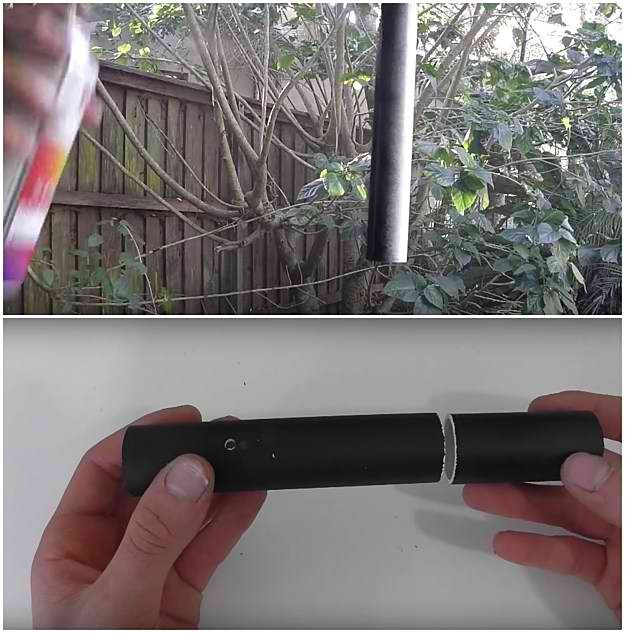 Finally, you can test your finished homemade stun gun! Make sure to take safety precautions and use this weapon for self-defense responsibly. Also, make sure to keep it out of reach of your youngsters.